The olecranon is the “pointy” bone at the tip of the elbow. A “bursa”—a small sac of fluid—covers the tip of this bone, allowing soft tissues such as the skin to slide over the bone. Normally, this sac has only a tiny amount of fluid inside of it and is essentially flat. However, sometimes, this area gets irritated and the body makes extra fluid inside the sac (see Figure 1). This can cause a big “balloon” to form at the tip of the elbow, which is referred to as oleceranon bursitis. There are many different causes of this extra fluid collection. Leaning on the elbow a lot or even hitting it on an object once can result in swelling. People who rest their elbows on hard objects while studying, talking on the phone, working out, or driving often have this problem. Some systemic diseases (like gout and rheumatoid arthritis) and procedures (dialysis for kidney failure) can be associated with olecranon bursitis as well. Sometimes a calcium deposit may form in the olecranon bursa (see Figure 2). In some cases, bursitis causes are unknown. 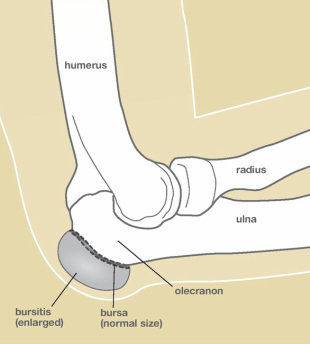 Olecranon bursitis usually looks somewhat like a golf ball on the tip of the elbow (see Figure 3). It can develop quickly or over time. Most of the time, olecranon bursitis does not cause pain. If there is pain, tenderness, redness, or warmth in the area, or if you have a fever, there might be an infection. Up to 20% of the time, olecranon bursitis is “septic,” or infected with bacteria. Figure 1. Elbow anatomy with swollen olecranon bursa. Figure 2. 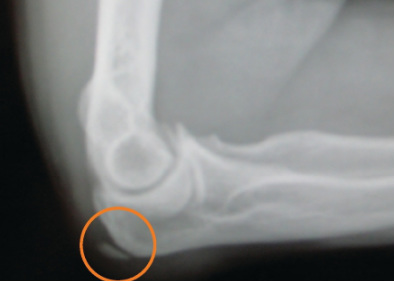 X-ray of elbow showing soft-tissue outline of olecranon bursa and a calicum deposit. Figure 3. 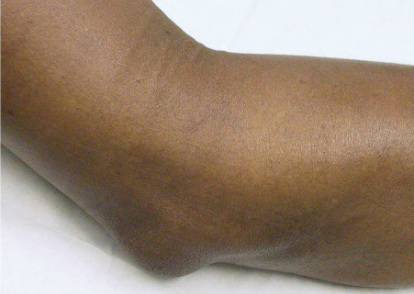 Swollen olecranon bursa. Your doctor likely will ask questions to try to determine if you have a systemic disease that might need to be treated in order to treat the olecranon bursitis. Most people do not. If you do not have pain, your doctor might recommend a resting splint and compression to rest the bursa and help speed recovery. Sometimes elbow pads can help, especially if you find that you are one of those people who tend to lean on the tip of the elbow a lot. Your doctor might want to use a needle to draw fluid out of the bursa (aspiration), especially if s/he is worried that there might be an infection. If there is an infection, antibiotics and fluid removal might cure the infection. Sometimes the infection is hard to cure with antibiotics and surgery is needed. If the bursa is not infected, and the bursitis continues to be a problem, additional treatment options may include repeated aspiration, cortisone injection and surgery.